This morning three beautiful Kudu bulls came to drink at small waterhole at Thanda. 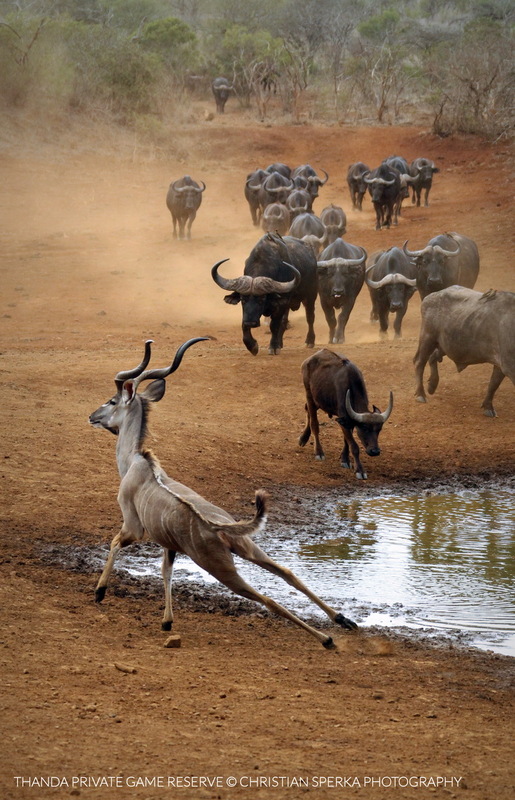 After they had quenched their thirst a herd of Cape Buffalo started stampeding the scene. The Thanda guests enjoyed this excited sighting after a action-filled game drive with a pride of eight Lions interacting with four White Rhinos (meaning: getting chased around by them :-)) while three Giraffe watched the turmoil. Oh Wow Christian, These are awesome! I particularly love the action you caught with the buffalo stampeding and the kudu freaked out! what a great shot! That one buffalo is huge too! One of my favorite shots this year!